Autism is a brain development disorder, with varying degrees, that can affect communication, behavior, and social interaction. Lauren, along with thousands of other children, was diagnosed with Autism. Having Autism made it very challenging for Lauren to make friends. It was hard for her to communicate and play with other children her age but she always had a deep love for animals. Her parents knew she deserved to have a loyal, trustworthy friend and thought a dog could be just what they were looking for. The family couldn’t get just any dog though; it had to be a very special dog. The dog had to be well trained so Lauren could walk it on her own. 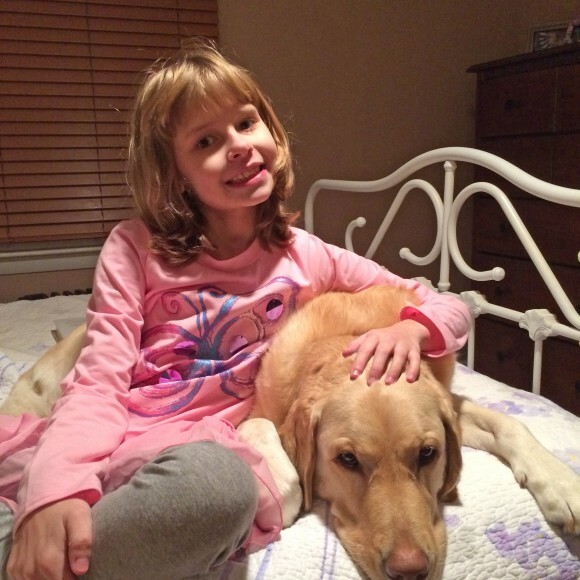 They needed a dog that was calm and able to soothe Lauren during an emotional outburst. They needed a friendly dog that would help Lauren socialize. The family wasn’t sure where to find a dog that would fit all of their needs until Lauren’s mom, Darcie, read an article about CPL in People magazine. That article forever changed their life. 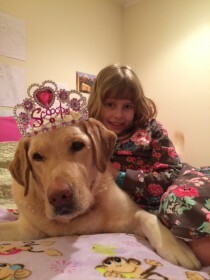 Darcie decided to apply for a home companion dog from CPL for Lauren and in May of 2010 the family made the drive from Connecticut to Pennsylvania and was introduced to Sara, a yellow Labrador. It was love at first sight! The family knew Sara would be the perfect match for Lauren. In the six years the two have been paired together, Sara has enhanced Lauren’s life in many different ways. Sara has helped Lauren become social. When the family walks through the neighborhood Sara starts conversations which helps Lauren interact with other people. “Most people want to pet and touch Sara which leads to many social interactions that we probably would not have had. Even strangers at the park will come over to see Sara and have a brief conversation,” says Darcie. Sara listens to Lauren when she gives her commands which increases Lauren’s confidence. Lauren has learned responsibility by having to care for Sara and feed her every day. When Lauren is upset, Sara provides emotional support and helps to soothe her. Sara has made life more enjoyable for the entire family but most importantly, Sara has become the loyal and trustworthy friend Lauren always wanted.